First, I still don’t know what the buttons do. This is ridiculous (and probably very stupid on my part) because, well, there are only two buttons, the digital crown and the side button. Most of the times, pressing the digital crown acts like an iPhone home button. But sometimes it’s a back button (like when you’re in the Favorites contact screen). It gets more confusing because you can scroll through a list with the crown but you can never select, you have to tap the screen for that to work. Most of these things you eventually figure out, but these little inconsistencies just add to the frustration of using it. With an iPhone, everyone knows how to use it, assuming they have access to fingers. With Apple’s wrist-time-box, I still find myself lost every time I grab hold, even if it’s just trying to recreate the steps to something I did earlier. Which mostly results in me just giving up trying to do anything at all. For its solid aesthetic design, the Watch is not at all intuitive. If you do manage to figure out how to do something with it and find a comfortable way to use it, there’s actually nothing worthwhile to do with the Apple Watch that you can’t do just as easily with an iPhone. Okay fine, that’s not all the way true but it’s not too much of an exaggeration. Most Watch apps just end up being a shell of the iPhone app. Other than that, there’s really nothing fun about using the watch. Not even for the most basic thing: telling time. The problem is that the screen doesn’t always turn on when you raise your wrist like it’s supposed to. So you’re left trying to snap your wrist hoping it’ll activate the watch screen. When it doesn’t, you feel like an idiot and look really stupid in front of your friends. And even if there were cool things to do with the Watch and they actually worked, the guts aren’t good enough to keep up with the mediocre tasks the Watch is theoretically supposed to be good at today. Charging the Watch every night is not the worst thing in the world (charging by magnetic stand is great, btw), until you wake up somewhere without an Apple Watch charger, and the watch is dead for the entire next day. Wearing the Apple Watch for nearly a year did change something in me though, but it’s the opposite effect that was probably intended: the Watch’s constant low-level notifications made me realize that there’s nothing really worth being notified about. Being able to feel every text, email, and whatever else, made me see how useless they mostly were. I used to joke that wearing a watch is handcuffing yourself to time. Wearing an Apple Watch (or any smartwatch, really), doubles down on that by locking you in a barricade of notifications too. So I’ve taken the Apple Watch off and don’t know when I’ll put it back on. The Watch isn’t at all worth it, but I’m not sure it’s even possible to make a smartwatch that I, or any reasonable non-tech nerd, would need. The more ambitious a smartwatch gets, the more complicated it is to use. 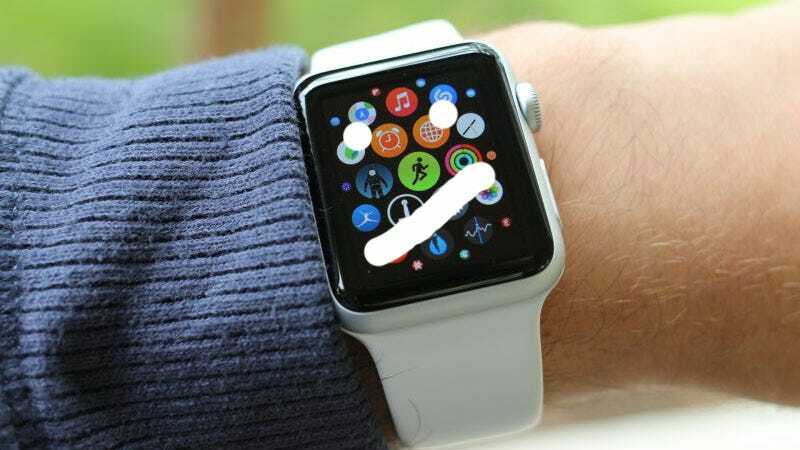 I’ve told every person who has asked me about my Apple Watch that as the wrist-puter stands right now, it’s really not worth the money or the effort. That doesn’t mean I don’t think it’ll eventually get better as Apple improves the hardware and software or if it maybe simplifies its goals, but a year with it has told me that it’s going to be a very long eventually. You shouldn’t buy this Apple Watch, and my sense is you probably shouldn’t buy the next Apple Watch either. But maybe (just maaaaybe) you’ll buy the next next one. Or the one after that.